I have received a lot of questions about the pajamas my girls wear from time to time that have little animal tails on the pants. My family bought them a few pairs as gifts during their annual trip to thailand. I attended the trip this year and asked if you all wanted me to bring some back for you guys - so here they are! *note* I am not responsible for the manufacturing of these clothes! I have had no issues with tails coming off, fading or shrinking or anything like that with the pairs my girls have (obviously that is why you can see them in the vlogs) but if there are lose threads or small imperfections like dried fabric glue on the tail - I can not correct them! I purchased these from the market in thailand already and picked the best ones I could. - First come first serve. These tend to be fast sales. Email fast and respond fast please. If you do not respond in any way within 2 hours I will move onto the next interested buyer. - All "PRICES" shown include USPS First Class Mail shipping cost. If you are intentional you will have an additional shipping fee that can vary from $5-10 depending on location. That will be discussed via email. - Packages are sent without tracking... unless requested for an extra $2! 5 sets for $60 shipped. [it would usually be $75 for 5]. For size reference Ayva (who usually wears carters 3T/4T) wears a medium currently. 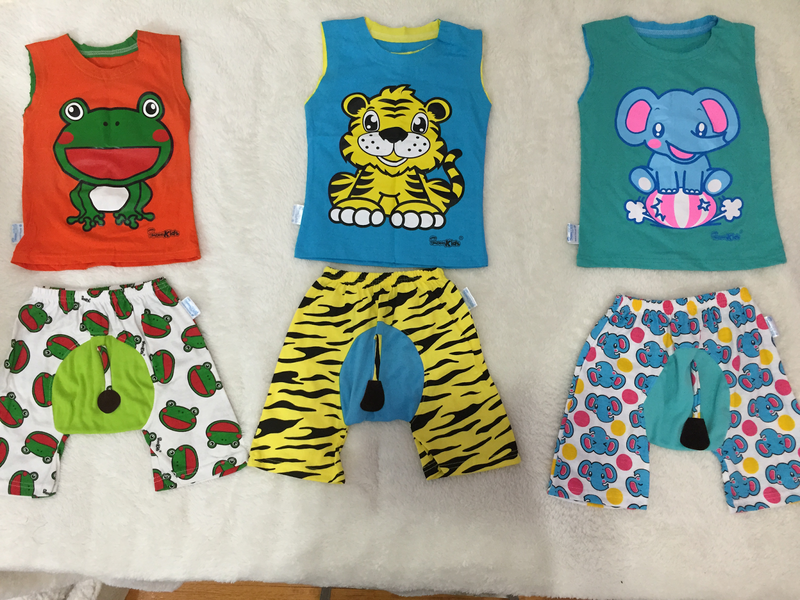 Goobie (usually wears carters 12M/18M size) wears a small. These pjs are forgiving and usually can fit for months as I will explain in sizing. There are two types of sleeve (shown below) which will be stated. Please take note that some are sleeveless and some are short sleeved. Of course these aren't appropriate for extremely cold winters but they are great for all of the other seasons or if your winter isn't that cold. You can always buy for later but once they are gone I might not be able to get my hands on anymore. I will put SOLD next to the pairs that are gone. Otherwise assume there is 1 if no additional numbers are shown. P.S after receiving your pjs I advise washing them once and they are so much softer! As with all kids clothes. I will update on other social media as I ship out.